Michael, GLG’s Shareholder and founder, focuses his practice on all aspects of land use & zoning, real estate and redevelopment. Michael spent almost 7 years at the premier real estate firm Allen Matkins Leck Gamble Mallory & Natsis, LLP where Michael honed his legal skills amongst California’s premier real estate practitioners. Michael’s practice also encompasses affordable housing, density bonus law, historical resources, local sustainable development compliance, and California Environmental Quality Act (CEQA) compliance. 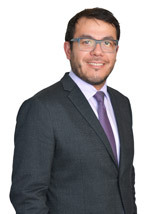 Michael has significant experience in developing entitlement strategies and obtaining entitlements for a range of commercial, residential and mixed-use projects in numerous Southern California jurisdictions. Projects include entertainment venues, restaurants, hotels, and urban in-fill mixed use projects. Michael is adept at managing the entitlement and development process, including assembling qualified project teams, overseeing technical consultants, negotiating with government agencies and officials, and, at times, negotiating with community groups. Michael never loses sight of the goal, successfully carrying development project from concept to reality. Michael has substantial experience advocating for project at all levels of the administrative process, including design review boards, zoning administrators, planning commissions and legislative bodies. Michael is very familiar with the process surrounding CEQA compliance, including environmental impact reports, negative declarations and initial studies. He advises clients on state land use laws, including CEQA, the Subdivision Map Act, and the California Redevelopment Law. Michael has significant experience conducting due diligence review of complex land use issues, including local zoning ordinances, subdivision issues, specific plans, redevelopment plans and related matters. He has also drafted numerous redevelopment agreements for both commercial and residential transactions, loan agreements, ground leases, easement agreements, and development agreements for various development projects. Michael has substantial land use and related development experience conducting due diligence review for lenders in connection with determinations to foreclose on troubled assets. Similarly, Michael has substantial experience conducting due diligence review in connection with the acquisition of real estate assets by investment funds, developers and other private entities. Michael is extremely skilled at quickly identifying land use issues that could impact a client’s bottom line and finding solutions to achieve client goals. Acquisition due diligence and post-acquisition assistance with the modification of entitlements for a 146-unit multi-family residential project. Obtaining entitlements, including a zone change, height and setback variances, and tentative tract map for a 95-unit mixed multi-family and commercial project. Obtaining entitlements, including a zone change, a conditional use permit, and parking structure variances for a 182-room luxury boutique hotel with rooftop entertainment area. Obtaining a conditional use permit for an approximately 35,000 square foot multi-story entertainment and restaurant facility. Obtaining a conditional use permit for an approximately 13,000 square foot nightclub in Hollywood. Obtaining a master conditional use permit for up to five bars and restaurants, a multi-story parking structure with executive office uses. Due diligence analysis of a large master planned subdivision in connection with a lender’s decision to foreclose on the asset. Due diligence analysis of a 350-unit multiple structure multi-family asset in connection with a lender’s decision to foreclose on the asset. Due diligence analysis of a 180-unit subdivision in connection with a private party’s note acquisition. Educational History: Michael earned his B.A. from the University of California, Los Angeles in 1999. Michael earned his J.D. from the University of Southern California Gould School of Law in 2002, where he was a participant in the Hale Moot Court, an editor for the Hale Moot Court Executive Board and 3L Class President. Languages: Michael is fluent in Spanish.